Posted on 3/20/2018, 9:19 am, by rackycoo, under General Projects. Hippity Hoppity, Easter’s on its way! Time for sightings of the world famous Easter Bunny. But wait, everything is not as it seems; some of these bunnies I’ve featured today appear to be imposters. Oh my, the ears are there, but this rabbit is undoubtedly a toothy t-rex in disguise. 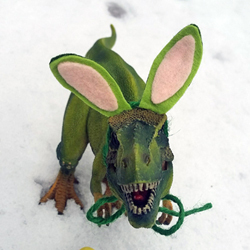 TheMistressT outfitted this scary dino with bright green bunny ears for a bit of Easter fun. If this isn’t the cutest little wannabe, I don’t know who is. 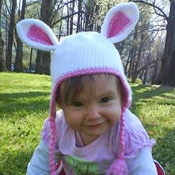 Wearing a crocheted hat by abni, this little rabbit is just adorable. That face! 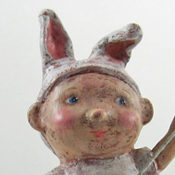 pottermouth created this whimsical bunny boy out of paper clay. 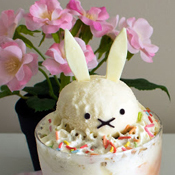 Here’s a bunny that’s not just sweet to look at, it’s sweet to eat as well. It’s actually a parfait, created in the kitchen of Emu. 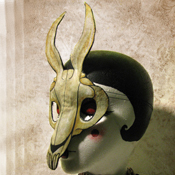 This rabbit mask by DeviSaya is more scary than cute, proving that bunny wannabes come in all shapes and sizes. Watch out around Easter time. If you think you see the Easter bunny, better make sure it’s the real deal. Wannabes are everywhere!